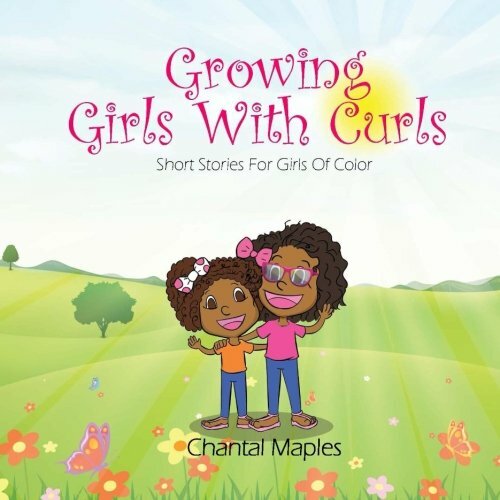 Not only is having a natural hair regimen important for adults, it’s important for children as well. The girl’s wash day routine consists of me shampooing and conditioning their hair every two weeks faithfully. We’re usually busy on the weekends and they both have a lot of hair, so I keep their wash day routine pretty simple. I co wash their hair with organic coconut oil overnight and proceed with the rest of our routine the next day. 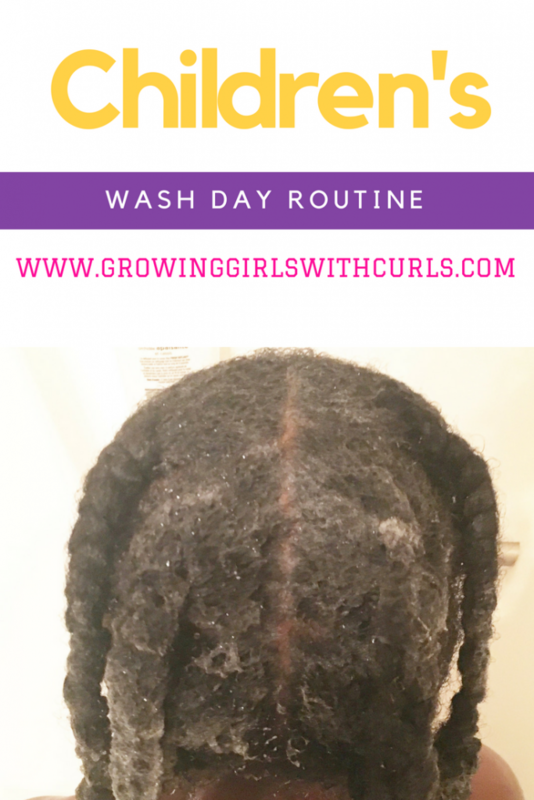 After I rinse the coconut oil from the girl’s hair and scalps, I use Cantu Care For Kids Tear Free Shampoo. 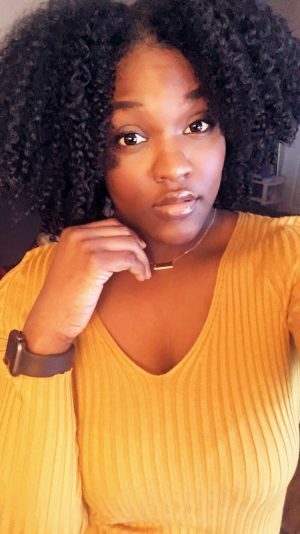 I immediately go in with the Shea Moisture Jamaican Black Castor Oil Strengthen, Grow, and Restore Treatment Masque. I deep condition their hair for at least 30 minutes then rinse. Next, I use Aussie Moist hair conditioner to detangle. When detangling, I put the girl’s hair in four sections. 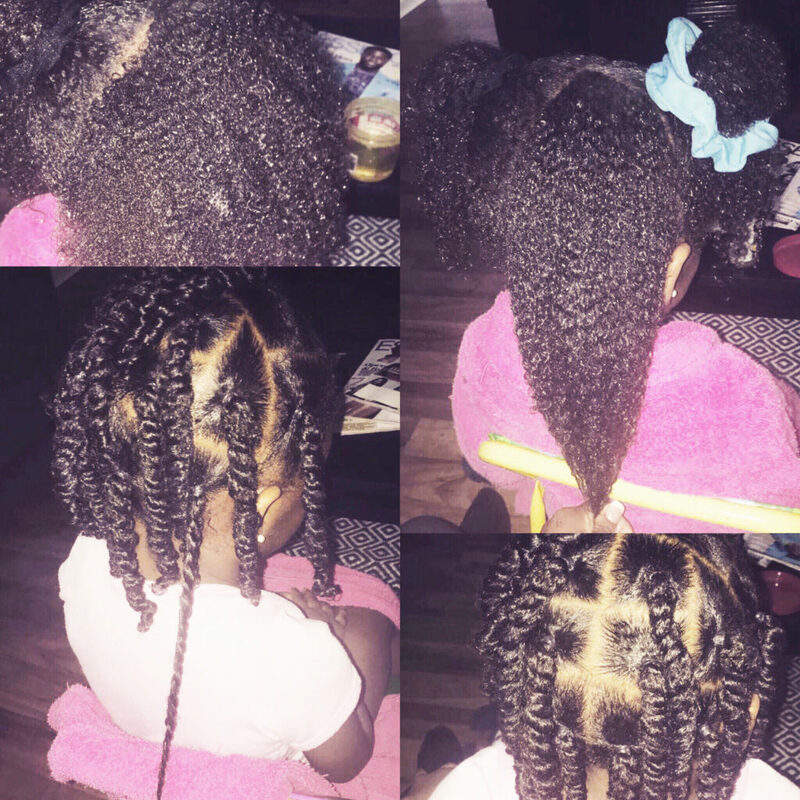 Because they have so much hair, working in sections makes detangling a whole lot easier. Once completely detangled, I apply Cantu Leave-in Conditioner to each section of their hair followed by Cantu Coconut Curling Cream. Aubrey usually gets her hair braided shortly after, so I just put her hair in a bun until then. For Courtlynn, I do two strand twists to last the entire week and I use the Cantu Tea Tree & Jojoba Hair & Scalp oil as a sealant. I pretty much use the same routine for the girls year round. Sometimes I have to switch products out, but for now this routine works for us. To learn how I do twistouts on the girl’s hair, click here. Don’t forget to subscribe to the email list, so that you won’t miss out on blog updates ! Beautiful hair!! Great list of products!! Looking at your post, seeing the pics and looking at my sisterlocks in the mirror make me happy for you son! I can’t wait to have a daughter but dread this process. Thanks for the tips! You’re more than welcome! Thanks for reading. I wasn’t blessed with daughters (but maybe one day with grand daughters), but I will share this post with my sister-n-law for help with her daughters’ hair. Thanks for sharing. Aww thanks for reading ! Oh I do remember the days when my sister and I will get our hair washed and detangler by her mom. Such a big job! I also love that you mention the Cantu coconut curling cream. That product smells awesome! I hated wash day growing up. I do everything I can to make sure it’s not an all day thing like it was back then. I agree, the Coconut curling cream does smell pretty good. This is awesome, they’re so lucky to have your help getting a headstart (haha) in life for healthy and string hair! I don’t think I like the routine that I currently use with my daughter, so I will definitely try your recommendation. I also am not sure that the products I’ve been using is keep her hair healthy and encouraging growth, so I will also consider adding the Cantu products you’ve listed. I’ve been using Mielle Organics….just not sure it’s working for her. Have you tried the Aussie Moist line on her? Such a nice routine! Kudos to you for instilling great hair habits! Thank you and thanks for reading !